The Shure SM10A is a low-impedance, unidirectional dynamic microphone designed for close-talk head-worn applications such as remote-site sports broadcasting and corporate intercom systems. It is also ideal for singing drummers, keyboard artists, and other performers who need a head-worn vocal microphone with superior noise rejection and a smooth, natural-sounding frequency response. The SM10A is very lightweight and is typically mounted on the supplied steel headband assembly. 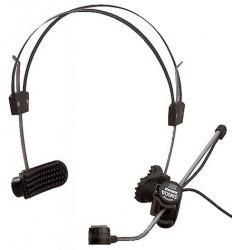 An adjustable pivot on the headband assembly allows the microphone boom to be moved 20 degrees in any direction. The boom also slides out so the microphone can be positioned up to 89 mm (3 1/2 in.) from the pivot housing. A supplied windscreen reduces wind noise and explosive breath sounds. A belt clip that fits over the XLR connector and attaches to the user's belt or waistband provides cable strain relief.